In the IELTS exam, it is important not to spend more than 20 minutes on Task 1, otherwise you may not have enough time for Writing Task 2, which is longer and is worth twice as many marks. When practising you will probably need more than 20 minutes at first. Keep a note of how long you take and try reducing the time for each practice test until you can do Task 1 in 20 minutes. These causes affected different regions differently in the 1990s, with Europe having as much as 9.8% of degradation due to deforestation, while the impact of this on Oceania and North America was minimal, with only 1.7% and 0.2% of land affected respectively. Europe, with the highest overall percentage of land degraded (23%), also suffered from over-cultivation (7.7%) and over-grazing (5.5%). In contrast, Oceania had 13% of degraded farmland and this was mainly due to over-grazing (11.3%). 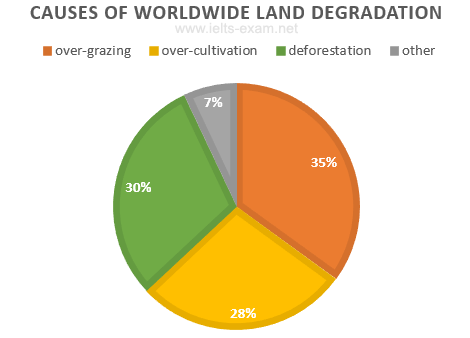 North America had a lower proportion of degraded land at only 5%, and the main causes of this were over-cultivation (3.3%) and, to a lesser extent, over-grazing (1.5%). Overall, it is clear that Europe suffered more from farmland degradation than the other regions and the main causes there were deforestation and over-cultivation.